Just as surgery balances harm and good to achieve a therapeutic response, a procedure must balance the exposure of normal and abnormal tissue. Exposure of normal tissue is, for the most part, needed only to orient the surgeon and avoid damage to critical structures near the surgical target. In traditional cran-iotomy, for example, exposure of specific cortical structures is routinely employed to allow the surgeon to estimate where the target lesion is located underneath the cortical surface. Other examples are seen in gallbladder surgery, in which it is needed to visualize the hepatic artery and to avoid damage to these critical structures, as well as during intracranial aneurysm surgery, in which visualization of perforators is required to avoid incorporating them into the clip that occludes the aneurysm. Employed in an ideal fashion, image guidance should completely obviate the need to expose tissue to orient the surgeon, as orientation would occur entirely through imaging. In reality, even with the best imaging technologies available, exposure of structures smaller than the resolution of the imaging employed is still required to avoid inadvertent collateral damage to tissue surrounding the pathology being targeted by the procedure. For example, it is impossible to visualize the striate arteries with a diameter of 0.5 mm using CT scans of 1 mm thickness. Therefore, visualization of small (<1 mm) structures is still required. It must be appreciated that exposure of normal tissue for visualization comes at a cost in terms of risk, and therefore, invasiveness, to the patient. The simple exposure of normal brain tissue, for example, may allow the tissue to desiccate, with subsequent damage. Also, exposure of normal tissue for orientation usually requires larger incisions, which are associated with more postoperative pain. Finally, exposure of normal tissue can allow inadvertent damage as instrumentation is moved in and out of the surgical field. Fig. 2. 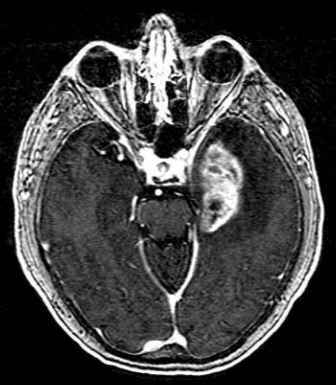 Contrast-enhanced CT scan of a frontal parafalcian meningioma. 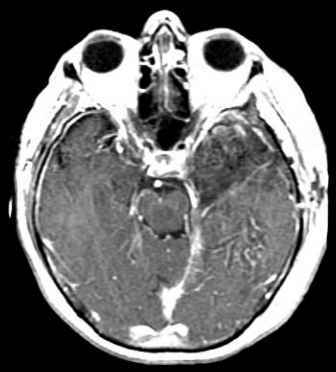 tumor to the sagittal sinus, the surgeon can either choose not to expose the sinus and position the skull flap as close as possible to the edge of this structure, or choose to make the bone flap extend over the sinus and avoid placing burr holes over the sinus, which could lead to significant blood loss. 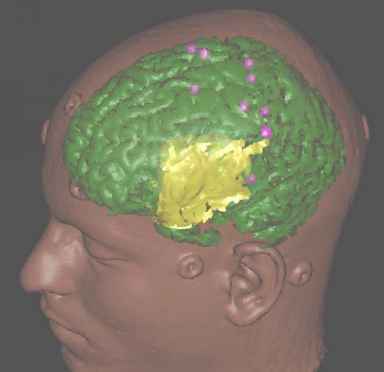 The dura can then be opened precisely to expose only the junction of the tumor and the underlying brain. In this way, essentially no normal cortex is exposed except that directly beneath the tumor, which is exposed following resection. This approach also minimizes the amount of dura resected with the tumor and limits the need for a tissue graft to cover the postresection dura defect. Fig. 3. Gadolinium-enhanced MRI of a medial temporal lobe tumor. through the anterior temporal lobe, sparing the dominant speech cortex on the posterolateral aspect of the temporal lobe, and allowing for a complete resection with no postoperative neurological deficit (Fig. 4). When one is using image guidance to avoid eloquent cortex (such as the cal-carine cortex or the precentral motor cortex), it is important to realize that the position of eloquent cortex in a specific patient may be significantly different from its location in the normal population. By studying individuals with strokes, as well as stimulation studies of patients undergoing craniotomy while awake, a standardized map of the location of key functions within the brain has been produced, which can be presented in the form of an atlas with these functions superimposed on an "averaged" brain. Neurosurgeons rely on these atlases to avoid such structures when planning surgical interventions. Sometimes when a surgical target is believed to be located within tissue located at a key functional area, removal of the target may be felt to entail such a high risk of postoperative deficit that intervention is considered to be ill advised. This concept has become embodied by the lay public as the so-called inoperable brain tumor, although it should be apparent that any brain tumor is removable and thus technically operable; the true determinant of operability is the attendant risk to the patient, and a more appropriate term would be "unacceptable risk." Therefore, a key factor in deciding the operability of a particular lesion is the relative location of eloquent cortex. Fig. 4. Gadolinium-enhanced MRI of the patient in Fig. 3 taken postoperatively. There are several choices for imaging function as opposed to structure. 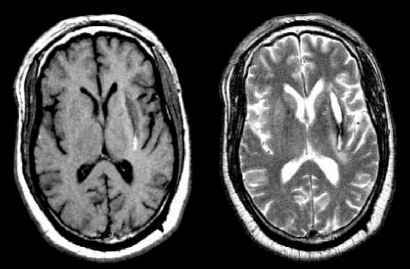 One of the most commonly used techniques is positron emission tomography (PET). This technique detects metabolic activation of specific areas while the patient being imaged performs a specific task. It has been used extensively as a research tool to delineate normal functional anatomy for elaboration of an atlas of nor mal human brain (14). Disadvantages of PET scanning are that is requires radioactive tracers, which are costly to produce and short lived, and that the detectors employed have a relatively low resolution, on the order of 2.5-3 mm. Many centers have now established the use of functional magnetic resonance imaging (fMRI), which employs a baseline study subtracted from an activated signal while the patient performs specific tasks (15). Metabolic activation of cortex causes a change in the MRI characteristics of tissue, and the subtracted images demonstrate the location of these activated areas. fMRI is now being employed by image-guided systems in many centers to depict eloquent cortex in an attempt to modify surgical interventions around these areas. The resolution of fMRI is considerably better than that of PET, on the order of 2-2.5 mm. A major limitation of both fMRI and PET is that both require metabolic changes in the brain in order to detect functional localization. Thus these imaging techniques actually depict epiphenomena of functional activity but do not depict the signal generated by the function itself. Attempts to use electroen-cephalography (EEG) to localize function have been frustrated by the high resistance of the human skull, which makes it difficult to localize the origin of specific electrical impulses caused by functional activity (16). This limitation is not seen in magentoencephalography (MEG). Rather than using electrical waves associated with specific functions, MEG uses a series of highly sensitive magnetometers to determine the origin of magnetic activity that arises during a functional event. MEG, therefore, offers the promise of precisely depicting the location of functional cortex so that it can be avoided during the course of an image-guided procedure. An example of such an intervention is given in Fig. 5 (see Color Plate 5 following p. 112). 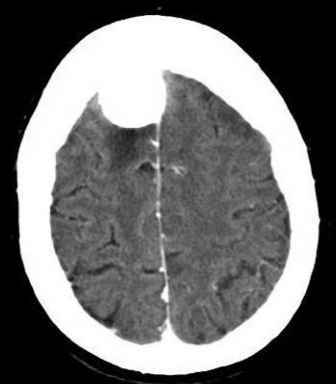 In this example, a 28-yr-old patient presented with a lesion felt by many to be inoperable, in that it was located in the left posterior frontal lobe. Evaluation was performed with MEG, which demonstrated that the motor and speech cortex were not involved with this lesion. This was confirmed by placing a grid over the cortex and stimulating the cortex postoperatively. When the MEG data were confirmed, the complete resection of a grade III oligodendroglioma was carried out using image guidance. The patient is now 6 yr postop, with no evidence of recurrence. Another important aspect of MEG is that it can be used to depict the location of abnormally functioning tissue, resection of which may benefit the patient. A typical example of this capability is the localization of an epileptogenic focus responsible for the generation of seizures intractable to medication. 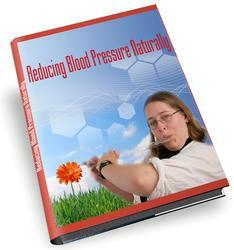 By accurately depicting an abnormal focus, resection of the focus may lead to cure of the seizure activity. As this tissue is usually structurally normal, but functionally abnormal, only by coupling MEG to an image guidance system can the surgeon be led to this focus accurately. tional tissue. In any case, the use of image guidance, with appropriate choice of guiding imaging, enables the use of minimally invasive concepts to be employed. In this way, image guidance can be seen as analogous to an endoscope or microscope as a powerful enabler of minimal invasiveness.